Zakynthos | Boat Trips | Boat Rentals | Authentic Local Experiences: Argassi...a resort suitable for everyone. Argassi...a resort suitable for everyone. 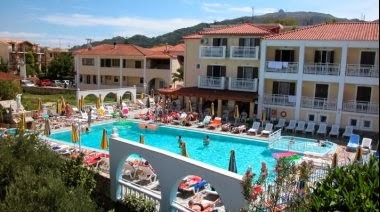 Argassi is the resort that is closest to the city of Zakynthos. 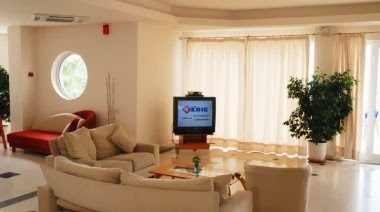 It is suitable for families, couples and larger groups of people since it offers many different types of entertainment. Argassi is the kind of resort that will offer anything that you may need for you holidays. 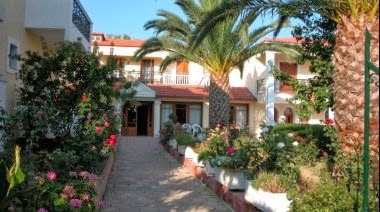 It is 4km from the city of Zakynthos and 6km from the airport. The local buses run very often to and from the area and taxis as well as car hire companies are very easy to find. The beach of Argassi is sandy but it is not as big as in other resorts. 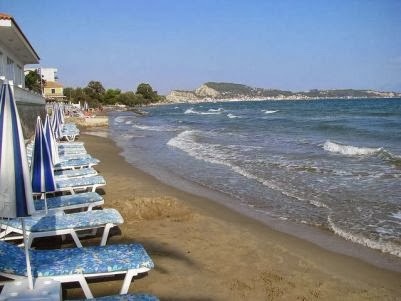 On the other hand Argassi is the closest resort to Vasilikos whose beaches are considered the best on the island. It is highly recommended to visit some of those fantastic and unique beaches. You will surely enjoy them. Argassi offers a wide variety of restaurants and taverns serving Zakynthian, Greek and international cuisine. It is the resort that most of the natives use for their night out. You can choose between big crowded clubs and quiet friendly bars that combine culture and entertainment. There are also very good fast food restaurants and coffee shops. 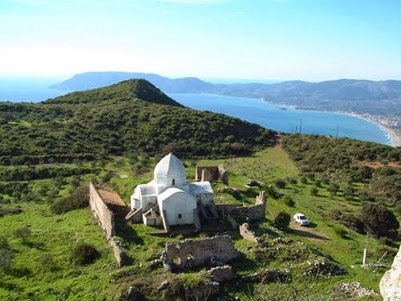 Tip: On the mountain of Skopos which is close to Argassi there is the historical church of Madonna of Skopos (Panagia Skopiotisa). It was built in 1624 and it offers a unique view of the island as well as an amazing feeling of relaxation and positive energy. Our personal experience and good knowledge of the resort fill us with confidence that we can suggest the right accommodation for you. We have made our research and we share the results with you. 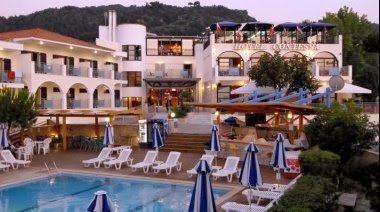 Argasi Beach Hotel is right on the beach of Argassi and very close to the center of the resort. 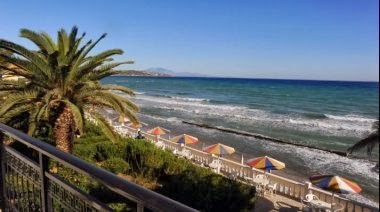 It offers breakfast and a snack bar next to the beach and it is ideal for people that seek relaxation and a quiet place to spend their holidays. Facilities: Garden, Sun beds and umbrellas on the beach, Continental breakfast buffet, Safety Deposit Box, Snack beach bar, Indoor Bar, Wi-Fi Internet access in public areas available at extra cost. Average Low Season Price: 45€ per night in a Double/Twin Room. 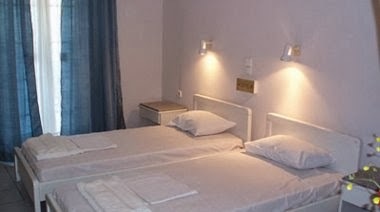 Average High Season Price: 55€ per night in a Double/Twin Room. 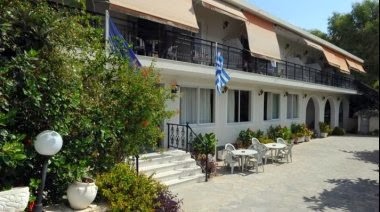 Agoulos Inn is a recently renovated hotel right on the beach of Argassi and only 150m away from the center of the resort. It offers a swimming pool, breakfast, indoor and outdoor snack bar and a night bar on the top of the hotel that offers exceptional view and unique decoration. 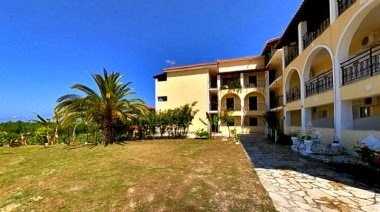 Facilities: Outdoor Swimming Pool, Garden, Elevator, Bar, Rooms/Facilities for Disabled Guests, Continental breakfast buffet, Children's Swimming Pool, Children's Playground, Snack Bar, Free Wi-fi Internet access in public area, Free private parking is possible on site (reservation is not needed). 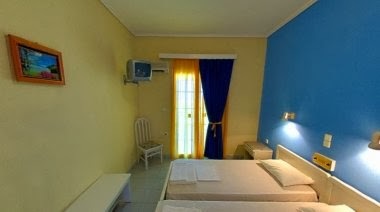 Average Low Season Price: 25€ per night in a Studio for 2 adults. 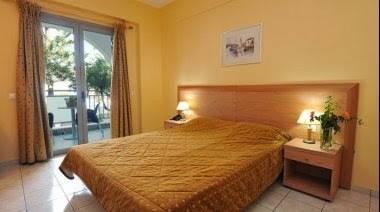 Average High Season Price: 55€ per night in a Studio for 2 adults. 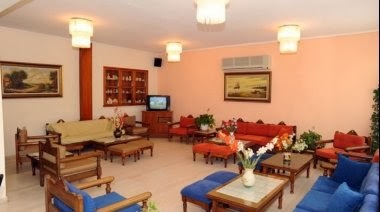 Α classic and well known hotel that offers all the necessary facilities for a memorable and peaceful stay. 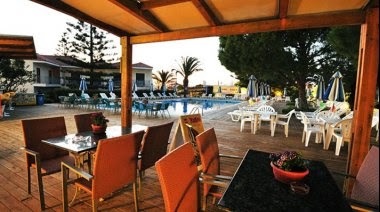 Palmyra Hotel is situated in the center of Argassi and only 150m away from the beach. In its recently renovated areas you can take advantage of the hotel’s swimming pool, restaurant, snack bar, playground and its spacious areas that will make you feel comfortable and relaxed. The staff of Palmyra hotel is always there for you, ready to serve you and make you feel welcome. 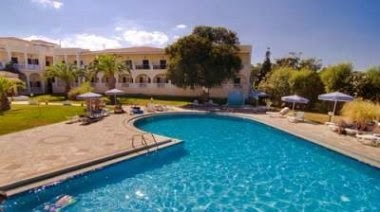 Facilities: Pool snack bar, Outdoor Swimming Pool, Restaurant, Garden, Bar, Air Condition, Children's Swimming Pool, Children's Playground, Shops in Hotel, Library, Pool Table, Free Wi-Fi Internet access in the rooms and public areas, Free private parking is possible on site (reservation is not needed). Average Low Season Price: 40€ per night in a Twin/Double room with garden view and BB. Average High Season Price: 70€ per night in a Twin/Double room with garden view and BB. Contessa Hotel’s staff is a big family that will do anything possible for your holidays to be unforgettable and to cover all your needs. Among all its high standard facilities, the hotel offers big spacious areas, swimming pool and snack bar, playground and a restaurant with amazing view on the top floor. Facilities: Pool snack bar, Outdoor Swimming Pool, Garden, Bar, Restaurant (buffet), Rooms/Facilities for Disabled Guests, Children's Swimming Pool, Children's Playground, Library, Room Service, Table Tennis, Games Room, Pool Table, Wi-Fi Internet access in public areas (available at extra cost), Free private parking is possible on site (reservation is not needed). Average Low Season Price: 36€ per night in a Twin/Double room with BB. Average High Season Price: 77€ per night in a Twin/Double room with BB. Xenos Camara Beach hotel is a new and modern hotel right in front of the beach of Argassi. It offers spacious apartments for families and couples and many facilities like swimming pool, restaurant and a playground. 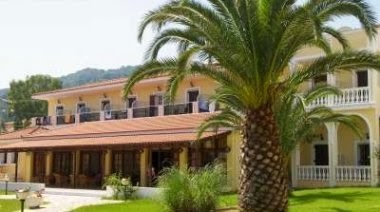 The staff has been working together with the owners for many years and they work really hard in order to make your stay in Zakynthos as good as it gets. 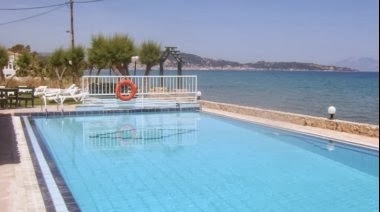 Average Low Season Price: 35€ per night in a Studio for 2 adults with side sea view. 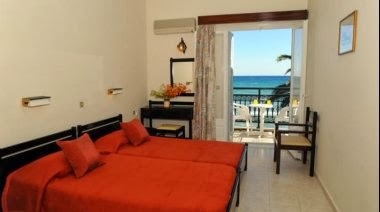 Average High Season Price: 80€ per night in a Studio for 2 adults with side sea view. Family Inn hotel is a really good value for many hotel that is ideal for families and couples and it offer breakfast and half board, a swimming pool and a snack bar. The staff of the hotel is always available and ready to understand and serve you in order for you to make the best out of your holidays. Facilities: Outdoor Swimming Pool, Outdoor showers, Garden, Children's Swimming Pool, Outdoor Snack Bar, Breakfast Buffet, Library, Pool Table, Free Wi-fi Internet access in public areas, Free private parking is possible on site (reservation is not needed). 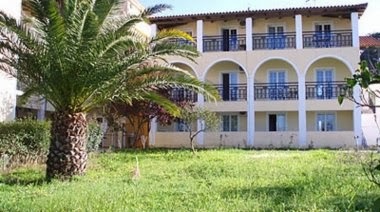 Average Low Season Price: 30€ per night in a Twin/Double Room. Average High Season Price: 40€ per night in a Twin/Double room. 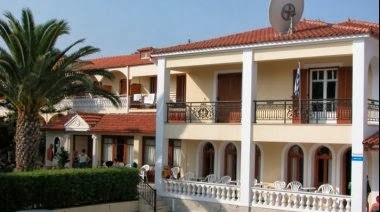 Penny & Elias offers spacious and spotlessly clean rooms and apartments at affordable prices in one of the most developed touristic resorts of Zakynthos, Argassi. 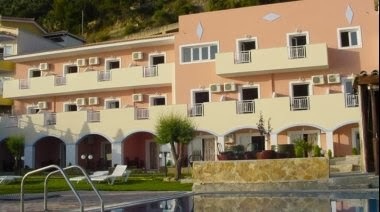 It is located in a peaceful and quiet environment 400m from the center of the resort and m from the beach. Facilities: Garden, Air Condition, Private Bathroom, Cooking Facilities, Free private parking is possible on site (reservation is not needed).